Is there a public good? A prevalent view in political science is that democracy is unavoidably chaotic, arbitrary, meaningless, and impossible. Such scepticism began with Condorcet in the eighteenth century, and continued most notably with Arrow and Riker in the twentieth century. 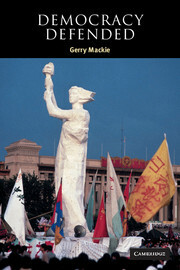 In this powerful book, Gerry Mackie confronts and subdues these long-standing doubts about democratic governance. Problems of cycling, agenda control, strategic voting, and dimensional manipulation are not sufficiently harmful, frequent, or irremediable, he argues, to be of normative concern. Mackie also examines every serious empirical illustration of cycling and instability, including Rikers famous argument that the US Civil War was due to arbitrary dimensional manipulation. Almost every empirical claim is erroneous, and none is normatively troubling, Mackie says. This spirited defence of democratic institutions should prove both provocative and influential. 1. A long, dark shadow over democratic politics; 2. The doctrine of democratic irrationalism; 3. Is democratic voting inaccurate? ; 4. The Arrow general possibility theorem; 5. Is democracy meaningless? Arrow's condition of unrestricted domain; 6. Is democracy meaningless? Arrow's condition of the independence of irrelevant alternatives; 7. Strategic voting and agenda control; 8. Multidimensional chaos; 9. Assuming irrational actors: the Powell Amendment; 10. Assuming irrational actors: the Depew amendment; 11. Unmanipulating the manipulation: the Wilmot proviso; 12. Unmanipulating the manipulation: the election of Lincoln; 13. Antebellum politics concluded; 14. More of Riker's cycles debunked; 15. Other cycles debunked; 16. New dimensions; 17. Plebiscitarianism against democracy; 18. Democracy resplendent.